Diabetic retinopathy is the leading cause of blindness in patients 20 to 74 years of age. The two forms of diabetic retinopathy result when the abnormal blood vessels of the diabetic patient begin to leak or collapse. Non-proliferative diabetic retinopathy occurs when blood vessels leak and fluid accumulates in the retina. When the leakage is severe ("clinically significant macular edema"), laser surgery can be used to reduce or eliminate the associated retinal swelling. Vision may not usually improve with the laser treatment, but if performed early enough, it may stop further vision loss. 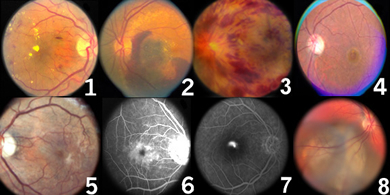 Proliferative diabetic retinopathy results from the collapse or closure of blood vessels. The retina becomes sick were the blood vessels have closed and releases stimulants for the growth or "proliferation" of new blood vessels. These new vessels are fragile and can easily bleed causing hemorrhage in the eye and blindness. Laser surgery can drastically reduce the risk of severe vision loss in patients with proliferative diabetic retinopathy. When severe hemorrhage or scar tissue develops the microsurgical procedure termed vitrectomy may be required to restore vision. In addition, we are actively pursuing clinical research in this area as well. 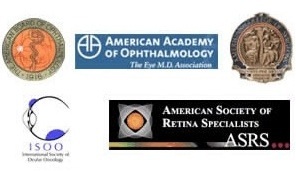 Macular degeneration (or age-related maculopathy) is the leading cause of blindness in the United States. It usually affects older patients- retirement age and above. Initial signs of macular degeneration may be picked up earlier, in the 40’s and 50’s. This is important since there is evidence that intervention with nutritional supplements and life-style changes may reduce the development of this blinding disease. There are two forms of macular degeneration- dry and wet. The dry form is usually less severe and reading vision is often maintained. The dry forms results from degeneration of the outer layers of the retina- the light absorbing photoreceptors and the retinal pigment epithelium (RPE). The RPE forms the blood retinal barrier between the outer retinal circulation ("choriocapillaris) and the outer retina (photoreceptors). With age, the waste products of vision accumulate beneath the RPE in little mounds called drusen. These proteinaceous and fatty-like deposits impede the flow of oxygen and nutrients and result in degeneration of both the RPE cells as well as the visual cells (photoreceptors). In the wet form of macular degeneration, abnormal blood vessles grow from the outer retinal circulation (choroid) beneath the retinal pigment epithelium (RPE) and sometimes into the retina itself. These blood vessels can leak fluid and protein and eventually form a scar. With early diagnosis of these blood vessels, laser surgery may be used to close the blood vessels and prevent further vision loss. Fluorescein angiography may be used to image the abnormal blood vessels and guide laser treatment. In addition, we have and will participate in a number of clinical studies using frontier therapies for the treatment of the most blinding form of macular degeneration. The macula is the area of the retina that provides the best vision for reading and fine detail. A hole in the macula can develop with age ("idiopathic" macular hole), trauma and in very near sighted people. Idiopathic macular holes are the most common, usually occurring in patients over the age of 50. This hole forms because the vitreous gel pulls on the center of the retina. Macular hole formation occurs in stages beginning with a cyst (stage 1) and ending with a full thickness hole with separation of the vitreous gel (stage 4). Reading and detail vision is ultimately lost. Vitrectomy surgery may be used to remove the vitreous gel and close the macular hole. Fine membranes (scar tissue) are peeled from the edge of the hole and a gas bubble or oil bubble is placed in the eye to help seal the hole while it heals. When gas is used, the patient must remain face down for some time after surgery to help the hole seal. If oil is used, it must be removed in a second operation. While most patients benefit, not all patients recover vision. Success rates vary depending on the type of hole, the duration of the hole and the stage of the hole. The other eye may become affected in 10% or so of patients. As with all surgeries, the risks, benefits and alternatives must always be considered. The macula is the area of the retina that provides the best vision- for reading and fine detail. Scar tissue can form in the center of the retina creating distortion and blurring of vision. This scar tissue is called macular pucker or epiretinal membrane. When the vision is only mildly affected, observation may be best. With significant distortion or blurring, however, vitreous surgery can be used to restore vision in the majority of patients. Patients generally recover half of the vision lost from the macular pucker after surgery. Vision recovery may take weeks to many months. As with all surgeries, the risks, benefits and alternatives must always be considered. Cystoid macular edema (CME) is caused by leakage of fluid into the retina. This leakage forms cysts in the center of the retina (macula) which can be seen best with fluorescein angiography. The leakage is usually from inflammation, which can result from many conditions including cataract surgery, lens implantation, retinal detachment, inflammation in the eye ("uveitis"), diabetic retinopathy or macular degeneration. The treatment depends on the cause. CME is most commonly found after cataract surgery. In these cases eye drops are first tried, including non-steroidal anti-inflammatory drugs (NSAIDS) and steroids. Thereafter a steroid injection behind the eye may be tried. Finally vitrectomy surgery may be required to remove the vitreous gel which may be pulling on the macula causing inflammation and leakage. It is important to realize that CME can result even following perfect surgery. In fact, as many as 25% or so of patients may have CME after cataract surgery. In most cases, however, the vision is not significantly affected. Central serous retinopathy (CSR) is caused by leakage of fluid beneath the retina. This bubble of fluid or blister causes blurred vision. CSR is typically seen in young males between 20 and 40 years of age often under stress or with "Type A personality". Steroid use is also a risk factor. The condition usually resolves spontaneously over weeks to several months, but can be chronic. In select cases, laser treatment may be used to speed up recovery. Fluorescein angiography may be useful in select cases - when the diagnosis is in question, in chronic cases, and when laser treatment is considered. Choroidal Melanoma is the most common primary adult ocular malignancy. With an incidence of 6 per million population, it also has a high morbidity and mortality rate. Current eye-sparing treatments include: Transpupillary Thermotherapy for small tumors, radioactive scleral plaque therapy for medium size tumors, and Gamma Knife Radiosurgery for large tumors.